The simplest volley drill is for either two players or four players to stand at the no-volley line and volley the ball back and forth. Each player should attempt to hit the ball to the other player in a manner that will allow them to keep the ball going. At all levels, the goal should be to keep quite a few balls going between misses. 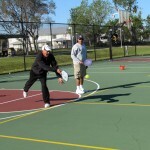 For beginning players, this might mean you are hitting the ball fairly slow and high and possibly even to the forehand. As you improve, you might hit the ball a little firmer and even try to hit to their backhand more often. You will find that all players at all levels will do best if you don’t hit the ball right at them. As players improve, you can hit the ball harder at each other and intentionally hit some to the backhand and some to the forehand and some right at the other player. If you are having long rallies, you can get more aggressive. If your opponent is starting to miss too much, then you should slow the ball down until he/she is successful again. 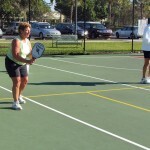 With only two players, you should practice not only volleying the ball straight ahead, but also crosscourt using both backhands and forehands. With 4 players you will get to practice both, but you should practice both from the leftside and the rightside of the court. Remember, the goal is to practice and keep the ball going, not to hit so hard the other player can’t get it back! However, you should be noticing any particular weakness they have in case you ever play them in a tournament. What happens if you don’t make it up to the non-volley zone line and get caught in mid-court? This isn’t the area you’d like to be, but it doesn’t matter where you are on the court — still at the baseline, halfway up to the non-volley zone line, or waiting there: the moment your opponent’s paddle makes contact with the ball, assume the ready position. Really do this! Don’t just think, oh, I can just stop moving. Put your paddle up and in front of you. Keep your weight on the balls of your feet and be ready to move, keeping your eye on the ball. Then, after you hit the ball, head for the non-volley zone as soon as it’s safe to do so. 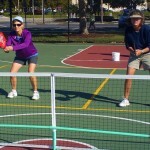 The ready position most people are familiar with is with your feet about shoulder width apart, knees bent slightly, your weight on the balls of your feet, and your paddle pointing toward the net so that you are ready to move to your forehand or backhand, depending on how the ball comes to you. This position comes from tennis where the court is large and there is more time between your opponent’s hit and your return. Using this ready position is fine when you’re at the baseline, but it may not be the best choice when you are up at the non-volley zone. 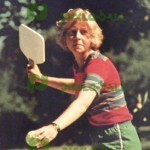 Hold your paddle in the backhand position up in front of your chest. This way, you can return most shots by simply rotating the paddle. If the ball comes to your forehand side, just rotate your body toward the ball and you’ll be able to reach the forehand volley. just before you serve—not while you’re serving and not too far ahead of the serve. 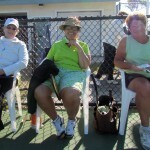 Call the score—then leave a few seconds for any questions or corrections before starting the serve. Doing this alerts all the players that you are preparing to serve the ball. Calling the score while you serve is very distracting to you and your opponents and is considered to be poor etiquette on the court. You’ll find that anything occurring while you serve will cause you to serve out of bounds, into the net, or otherwise to serve poorly. Learn the basics or improve upon your basics. 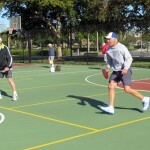 Footwork: how to get to the ball. Basic rules: Was that shot good? 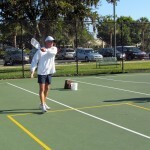 How to contact the ball, forehand and backhand strokes. 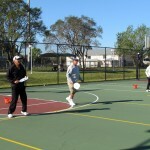 Things you can do off-court to improve your game. 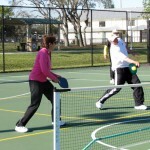 Email info@pickleballnaplesfl.com to schedule your lesson today. Or talk to me at Fleischmann Park between games. 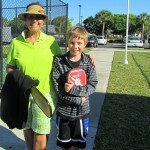 “I took my first PickleBall lesson ever with Jerry and enjoyed it tremendously. 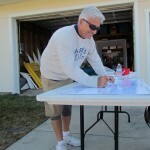 He is a competent, thorough and patient instructor. 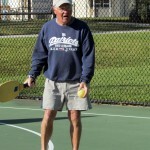 Jerry’s huge interest in the game of Pickleball is obvious and infectious. He truly wants you to succeed, and therefore, gives you the knowledge you need by explaining and demonstrating techniques and the proper way to play the game. Get back to the ready position quickly after every ground stroke and especially volleys with your paddle way out in front of your body. 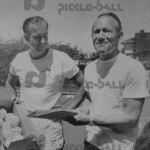 In doubles play with right-handed partners, the stronger partner should start in the odd (left-hand) court to maximize use of his forehand (which is covering the middle). If the stronger partner is left-handed, have him start in the even (right-hand) court and agree that he will take the center-court shots. Get to the non-volley zone and try to stay there. Why? From the NVZ, you can hit drives more deeply, you can volley, dink, and lob, and all of this requires far fewer steps to reach the ball, no matter how it’s hit to you. The team that stays at the non-volley zone the most will usually win more points. Try a drop shot into the non-volley zone or a lob over your opponent’s head that will give you time to safely move up from the baseline to the non-volley zone. When a dink or drop shot lands very close to the net, try to step into the non-volley zone using only one foot, keeping the other foot outside the zone behind the line. As soon as you hit the ball, step back out of the zone behind the line. This may not be possible if you are very short or if the ball barely makes it over the net, but otherwise should become second nature. Stepping back out immediately leaves you ready to return a volley or any other shot without incurring a fault, and it’s much easier to step out if only one foot is in the zone. When you move forward from the baseline, keep your body facing forward. When you reach the desired position close to the nonvolley zone, assume the ready position. 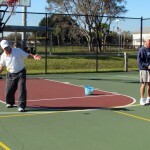 All of this needs to be done before your opponent hits the ball. Any time you can move close to the non volley zone safely, do it. 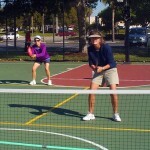 In doubles, it’s best if both partners move in tandem, so if you can both move up safely, do so. If not, wait until both of you can. But what constitutes “safely”? When you are sure you’ll have enough time to get to the non volley line and not be caught in midcourt with a ball aimed at your feet. When you miss a shot, you may think you weren’t watching the ball. Sometimes you are watching the ball, but you may not be keeping your head still. When you hit a ball, your eyes will instinctively follow the ball’s path until the moment of contact (even if you can’t really see the ball traveling that fast). Keeping your head still throughout your shot will help you maintain better balance. This is particularly important on shots close to the net, especially when you have to run up to reach the ball. It’s very tempting to raise your head just before you contact the ball in order to watch the intended target. This typically results in poor ball contact and a loss of accuracy. The little things can win or lose a game. UCLA basketball coach John Wooden used to start every season by teaching his players how to tie their shoes. Actually, he had them learn to put on their socks properly first. All this because it avoided blisters and made game play much more comfortable. It’s the little things that can make a large difference in your game. The grip of your paddle – is it too large or small? Is it too short or too long? Is your paddle too heavy? Not responsive enough? 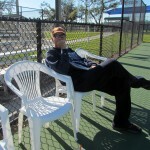 Take time to analyze the details and try new things to make your game better. Pictures and visuals help me learn. 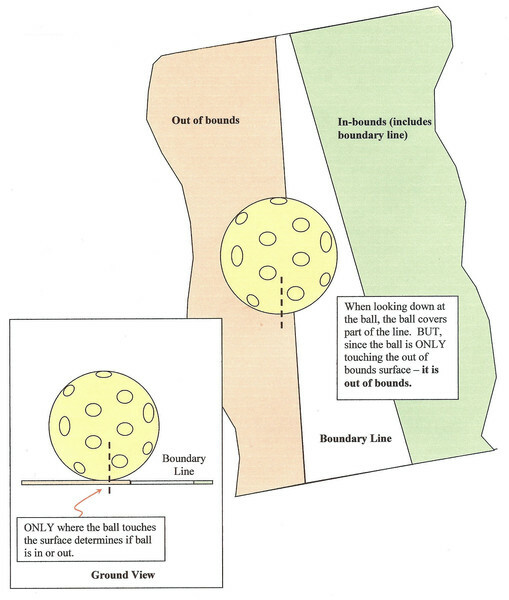 This picture from the USAPA showing how to accurately view the ball as it hits the line. 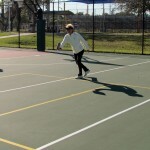 Some players, especially if coming from tennis, may think the ball compresses giving it more of an area to touch the court surface but that is incorrect. 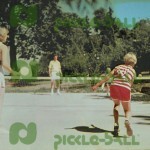 A pickleball is hard and only a small section of the ball actually hits the court. Check out this visual and make the right line call. Help Your Partner With Line Calls. 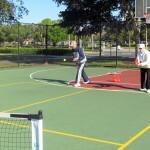 When your partner is trying to make a difficult shot, it is often hard for that player to concentrate on the line and the shot at the same time. Your partner is counting on you to make the out call if necessary. 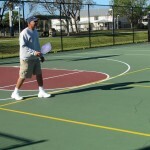 It is very common to see players looking straight ahead while their partner is playing the ball. You should always watch the ball so that you can help your partner with the call. 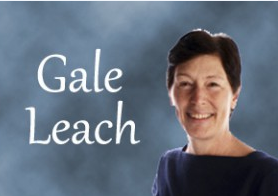 Otherwise, you may be giving away points if your partner is unable to make the call. If your partner calls the ball out and you see that it is clearly in, then you should declare the ball to be good. When you disagree with your partner about a line call, the benefit of the doubt always goes to the other side. Never play the point over. ( I am not sure about this I will check with Cindy and Nancy). 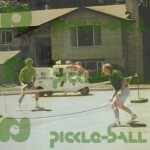 Pickle-ball® was the first game ever play inside the King Dome- Seattle, WA (from 1965 to 1977). 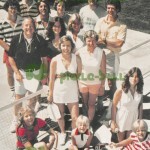 Most of these pictures were taken on one of the original Pickle-ball® courts in Bainbridge Island, WA during the early 1970’s. • NEVER SACRIFICE PLACEMENT FOR POWER. A SLOW BALL AT YOUR OPPONENT’S FEET IS BETTER THAN A VERY FAST HIT TO THE WAIST. • NEVER SACRIFICE BEING IN THE READY POSITION FOR A BETTER POSITION ON THE COURT. 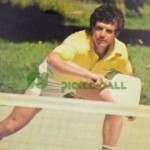 ALWAYS STOP AND BE IN THE READY POSITION AT THE POINT OF CONTACT OF THE BALL TOUCHING YOUR OPPONENTS PADDLE. 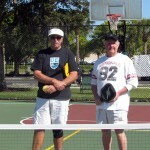 • THE TEAM WITH THE LEAST UNFORCED ERRORS USUALLY WINS, NOT THE TEAM WITH THE MOST WINNERS. • A GOOD VOLLIER WILL USUALLY BEAT A GOOD GROUND STROKER. THE GROUND STROKE IS JUST MEANS TO GET TO THE NVZ LINE AND WIN THE POINT. • YOUR BEST POSITION ON THE COURT SHOULD BE EITHER ONE FOOT BEHIND THE BASELINE OR ONE INCH BEHIND NVZ LINE. STAY OUT OF NO MAN’S LAND. • THE TEAM HITTING DOWN INTO THE COURT MOST OF THE TIME WILL WIN MORE POINTS THAN THE TEAM ALWAYS HITTING UP,SO KEEP YOUR HITS LOW TO THE FEET. IT WILL PROBABLY BE THE DIFFERENCE IN A CLOSE GAME. • NEVER EVER MISS YOUR SERVE OR RETURN OF SERVE. 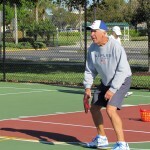 • MOST OF YOUR SHOTS SHOULD BE DOWN THE MIDDLE OF THE COURT, OVER THE LOW PART OF THE NET, GIVES YOU A LOT OF LEEWAY RIGHT AND LEFT, AND CAUSES CONFUSION BETWEEN YOUR OPPONENTS. • PATIENCE IS A VIRTUE WHEN DINKING. 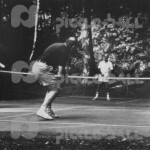 DO NOT TRY FOR A WINNER UNLESS BALL IS MORE THAN 12’’ ABOVE THE NET. 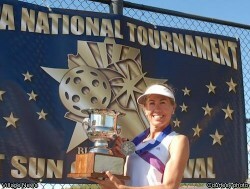 • NEVER TRY AND HIT A WINNER OFF A VERY DIFFICULT SHOT. 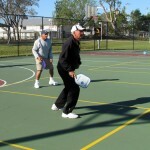 JUST PLAY DEFENSIVE AND TRY TO RETURN THE BALL LOW INTO THE COURT. 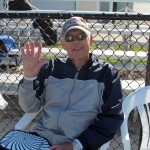 • A bowler first PAUSES to aim the ball at his target— steps toward his target— and follows through toward his target. 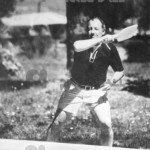 • A good volleyer PAUSES to aim the face of his paddle at his target— steps toward this target (if possible)— and follows through toward his target. • Whenever possible PAUSE to aim (set the proper angle and direction of the face of your paddle) step and finish toward your target. Do not rush or guess… AIM! • Crosscourt — The opponent’s court diagonally opposite yours. • Half-volley – A type of hit where the player hits the ball immediately after it has bounced in an almost scoop-like fashion. 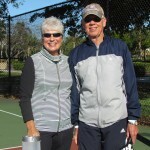 • Let serve — A serve that touches the top of the net and lands in the proper service court (it is replayed without penalty). 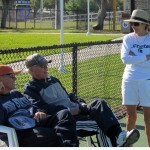 • Poach — In doubles, to cross over into your partner’s area to play a ball. • Rally — Hitting the ball back and forth between opposite teams. 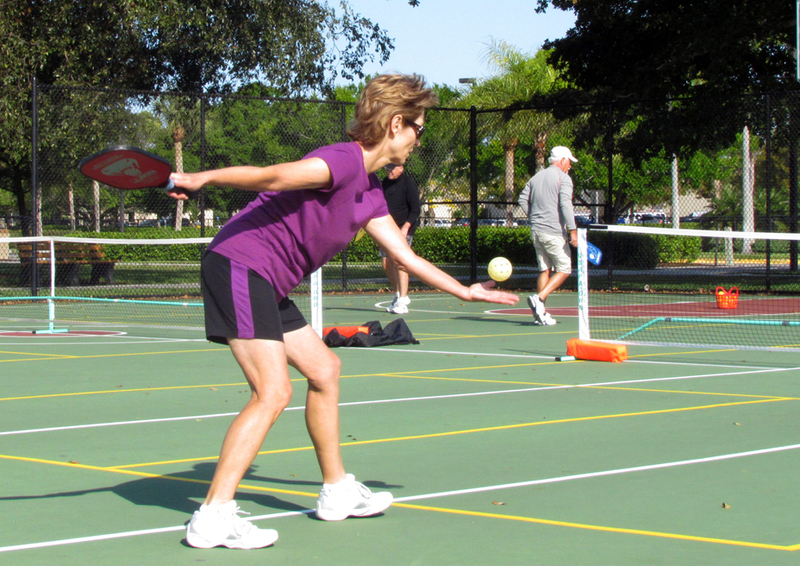 • Serve (Service) — An underhand lob or drive stroke used to put a ball into play at the beginning of a point. • Server number — When playing doubles, either “1” or “2,” depending on whether you are the first or second server for your side. This number is appended to the score when it is called. 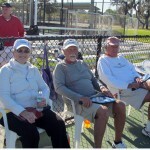 As in, the score is now 4 – 2 – second server. • Volley — To hit the ball before it bounces. Return of Serve. Very often, the best return of serve is a soft floating return that keeps your opponent in the back court. 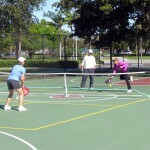 You will be taking advantage of the 2-bounce rule that prohibits the serving team from volleying the return of serve. 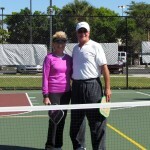 The soft floater gives you and your partner plenty of time to establish your positions at the no-volley line. When you control the no-volley line, you have assumed the offense and put the serving team on defense. The other advantage of using this type of return is that it is one of the easiest returns to make and greatly cuts down on errors. Is it OUT or IN? The ball can only touch the court at one point. As you can see in the first photo below, the center of the ball is touching the red. So, even though part of the profile of the ball is over the top of the line, the ball is out. 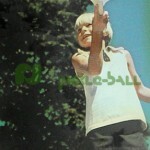 The second photo shows a ball that is good because the center is touching the white line. Reference: section 6C of the official USAPA rules. Note that this rule is different than the rule for tennis. 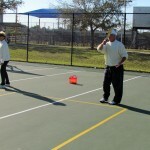 A tennis ball can flatten out when it hits, so if any part of the tennis ball touches the line, it is called good. Anticipation. 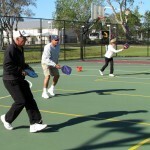 Pickleball is a very quick game requiring fast reflexes for those quick exchanges at the no-volley line. The best players give themselves an edge of just a fraction of a second by anticipating the shot. If you wait for your eyes to pick up the flight of the ball after it is struck, it may be too late. 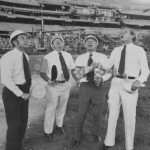 It is important to take note of the visual clues that will tell you where the ball is most likely to go. 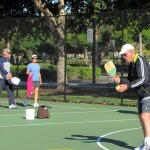 Observe the speed and angle of the paddle as the ball is struck so that you can begin to react and shift your weight before the ball is actually hit. Also take note of the position of the feet for another visual clue of the general direction in which your opponent is aiming. You don’t need to look directly at the feet. 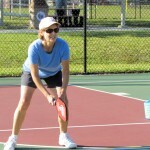 You can usually see the feet in your peripheral vision as you keep your eyes on the paddle and ball. 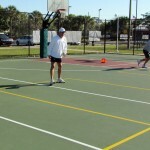 Most people think their choice of where to hit the ball is limited to one half of the court or the other. 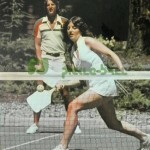 The best way to visualize the court is to divide it into three lanes. One lane down the middle and one on either side giving you three choices, or three lanes, to place the ball. Always know where you want to place the ball BEFORE you hit it. At the 5.0 level you really have to protect all lanes because they can place a shot down a lane (or line) at any time. So BEFORE you hit the ball, have a target, pick a lane and go for it! 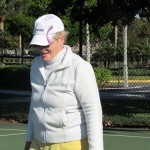 Mary asks: I am new to pickleball and everyone talks about the dink shot. What is that? 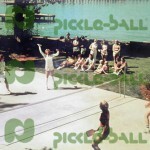 The definition from the Official Tournament Rulebook states: A dink shot is a soft shot that is intended to arc over the net and land within the non-volley zone. This shot is important to have in your bag of shot choices. Dink away!